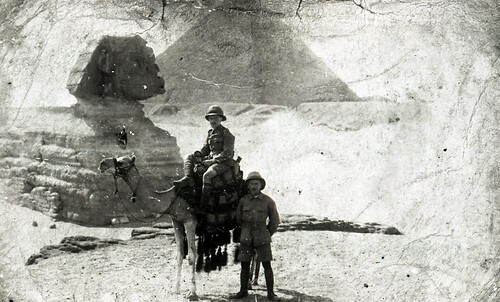 While searching through the vast array of World War One images available for viewing on the Manchester Archives+ Flickr, I found myself stopping to pay particular attention to images of soldiers on camels; often, posing before well-known Egyptian landmarks. 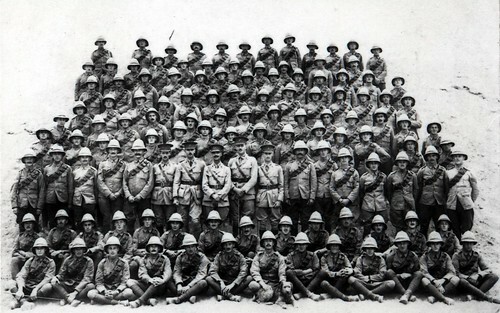 Although documentation of the British presence in the Middle East during World War One is unsurprising in itself, these photographs offer a more personal and tailored approach to British actions in Egypt and surrounding areas, and provide a striking contrast between their militarily-focused foreground and eye-catching background. 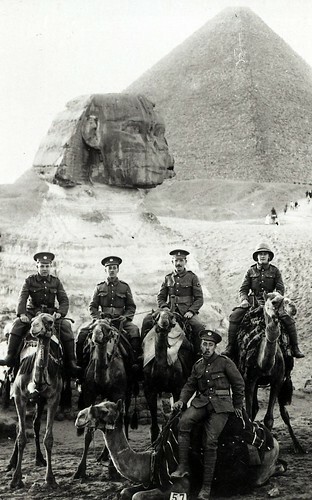 This image depicts a group of five soldiers mounted on camels, and posed in front of the enduring figure of the Sphinx. Although camels were required by British forces to supply soldiers as they crossed the treacherous Sinai Desert, it also appears they were used as a means of all-purpose transportation to properly navigate Egypt. Furthermore, this particular photograph was part of a larger collection belonging to John Beeston Harwood, born 2nd March 1886 and part of the 5th Territorial Battalion of the Welch Regiment during World War One. He and his comrades also served in Palestine and Gallipoli – two other major campaigns for British troops overseas at this time. 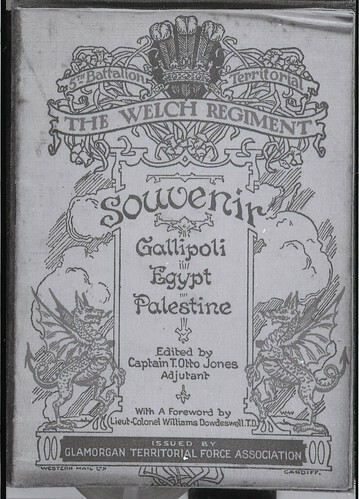 This is documented below, on the cover of a booklet issued in 1920 to commemorate the battalion and their service. The following photograph depicts a similar set-up – this time, just two soldiers in front of the Sphinx – from a collection of images of James Goodier. A member of the Manchester Regiment during World War One, Goodier kept a detailed record of his day-to-day life as a soldier in the Middle East in the form of letters to his wife and children, as well as the other photographs we have digitised on our Flickr stream. It is also known that he served in Mesopotamia – another campaign fought in the Middle Eastern theatre during the First World War. To Elsie from Jack Egypt Xmas 1914. Although we know relatively little about Jack, Elsie or any of the soldiers in the photograph, it still provides an interesting and personal viewpoint from which to view the battles and correspondence of World War One and, in this case, the Middle Eastern campaign. To conclude, the digitisation of images from World War One has enabled us to gain a more individual, intimate insight into the lives of soldiers and their daily activities as part of a Regiment overseas. We may never be able to access the full context behind certain photographs, but they provide a road into further research and source collection to contribute to the Centenary Project. For me, it was the sights of Egypt that caught my eye – why not visit our Flickr set and see what sparks your imagination?